Warm and sunny and a perfect late winter butterfly day! 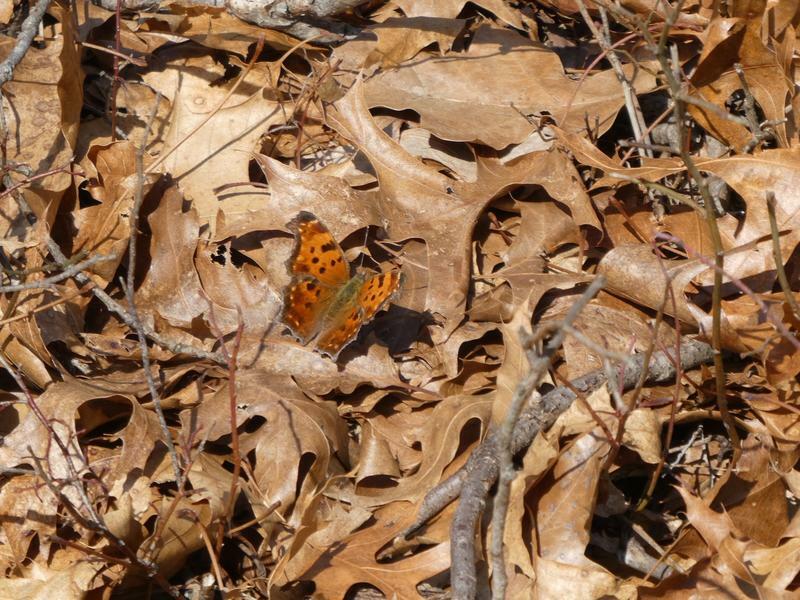 4 Eastern Commas at Jamebsurg Park Conservation Area, two at Frost Woods and two Mourning Cloaks there too. 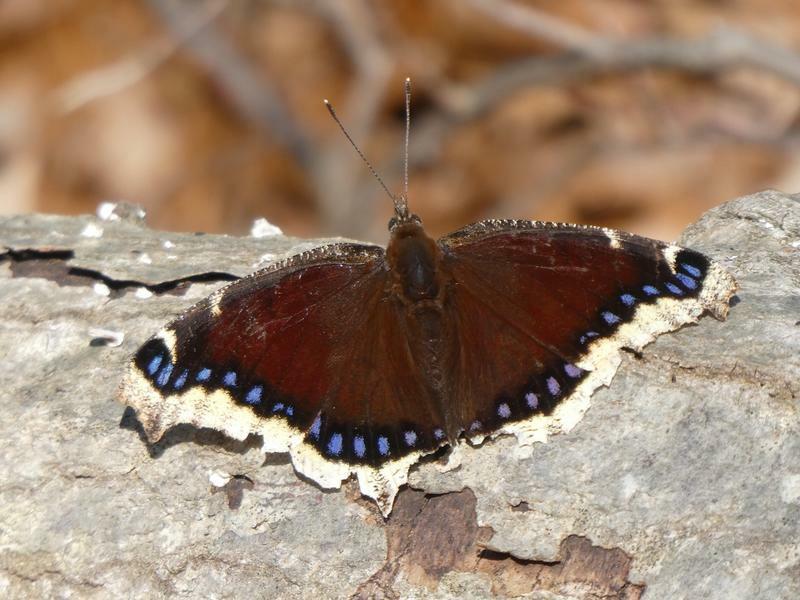 [Moderator's Note]: First report of overwintering butterflies in northern NJ. Time 1500, mid 50's, filtered sunlight, 10 mph breeze. I spent the early afternoon walking the trails at Allaire State park, hoping to encounter a Mourning Cloak or an Anglewing. I had no luck and decided to return home. As I was turning into Merrick Road from Rt. 524, a smallish butterfly flew in front of my car. Since I was in the middle of a turn, I could not stop to use my binoculars. The insect was some 15 to 20 feet away, and about 20 feet off the ground, so I was confined to a naked eye ventral only view. Given the relative closeness of the butterfly, I was able to secure a decent look. Alas, it had no real field marks. I could see no clearly defined marks nor color, The size was good for Cabbage White or a Sulphur, but the near absence of color, ruled out a Sulphur. The ventral parts were a blurry gray-dingy white with a faint suggestion of beige or yellow on the hindwing, so I decided it was a Cabbage White, a common resident of this area. [Moderator's note]: Our first butterfly of the year–let the fun begin! My first butterfly of the season. Mostly cloudy and 65 degrees. Observation of comma at 12:45pm. First butterfly of the year for me. 10:30-12:50, sunny, temps in the 50s. Our first butterfly of 2019 - oh happy day! 1320, 48 degrees, sunny, 12 mph SE breeze. Butterfly was basking in my backyard. Observations from Noon-2:00pm. 2 unided anglewings. Troy Meadows, Troy Meadows Rd. Mostly cloudy, 76ºF, 1:45-2:30pm, comma flew up to nectar on Red Maple blossoms. Late AM, 70 degrees, mostly sunny. Observations during a walk with a large group of birders with Washington Crossing Audubon Society. 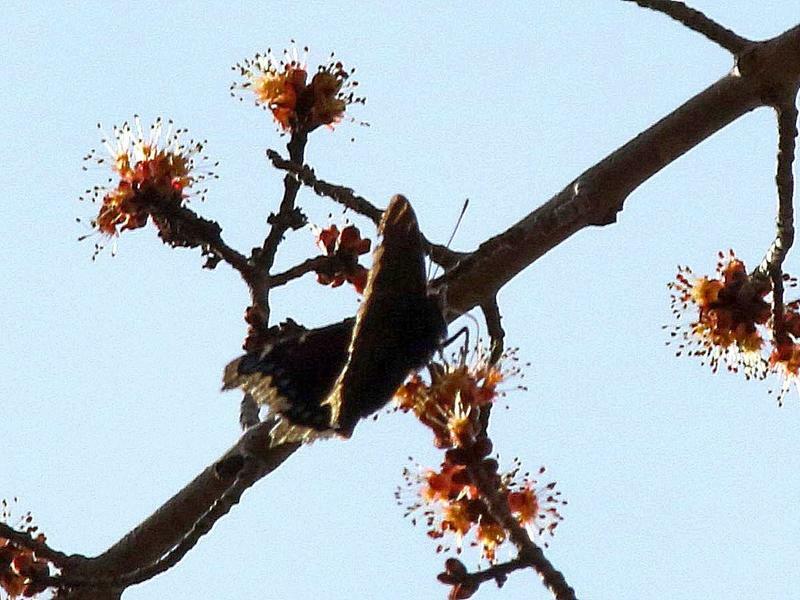 Oone Mourning Cloak was nectaring on Red Maple blossoms. 12:30-1:15pm, high clouds, 75ºF, trail very muddy and wet, Spring Peepers and Wood Frogs were heard all around, hardly any buds on shrubs or trees. 76F. Lots of people out! White Lake Natural Area, Hardwick Twp. 10:30-11:15, sunny-ish, temps in the high 50s.